Fate always seemed to deal Mott The Hoople a peculiar hand. Four years’ toil on the Island label had brought them a reputation as one of Britain’s must-see live bands, yet no one seemed to be buying the records. By 1972 they were resigned to sharing stages with circus jugglers and comedian Max Wall. Utterly dispirited, they’d all but split. Then David Bowie offered them one of his own new songs, All The Young Dudes, and Mott The Hoople were reborn as swaggering rock’n’roll hit-makers. By the following year they’d become regulars in the British charts and were playing to packed crowds both here and in the US. Lead singer Ian Hunter, the quintessential early-70s frontman in outsize shades and a cascading frizz of big hair, had emerged as their primary songwriter. The major success of singles Honaloochie Boogie and All The Way From Memphis, both from Top 10 album Mott, suggested the band’s rollicking glam’n’roll was finally here to stay. And when Hunter came up with another big smash later in ’73, Roll Away The Stone, it seemed like the good times might never end. Peaking at No.8 in November ’73, Roll Away The Stone was the crowning glory of Mott The Hoople’s commercial era. It even sounded like a celebration. With honking sax, a squealing guitar and ‘shoop-shoop’ backing vocals from all-girl trio Thunderthighs, the song transposed the euphoric flash of 50s rock’n’roll onto the hard-bitten 70s. 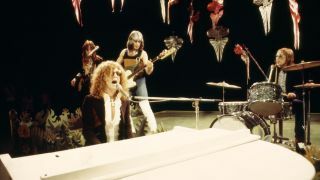 The Golden Age Of Rock’n’Roll would dent the Top 20 in ’74, but Roll Away The Stone was effectively the band’s last major hit. Ralphs’ replacement was ex-Spooky Tooth guitarist Luther Grosvenor, aka Ariel Bender. More flamboyant than his predecessor, Grosvenor added a dash of showmanship to Mott The Hoople that chimed with the vaudevillian madness of glam rock. He ended up playing on the album version of Roll Away The Stone that appeared on The Hoople. Lynsey de Paul, incidentally, did the spoken bridge part. Mott The Hoople had ended 1973 on a roar, climaxing a 22-date tour of the UK, supported by Queen, with two shows at Hammersmith Odeon. The second sparked a near riot when the venue’s management brought the safety curtain down on the band during the final encore. But with Ralphs gone, Hunter was starting to feel the strain. Bowie’s former guitar hero Mick Ronson was brought in to replace Grosvenor later in ’74, but Mott The Hoople were essentially over.